Canadian Prime Minister Justin Trudeau with President Trump at the White House in October. Trump was recorded telling attendees at a private GOP fundraiser that he had falsely stated the U.S. has a trade deficit with Canada in a meeting with Trudeau. 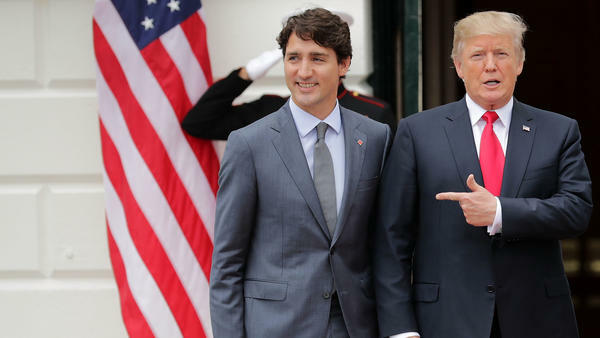 In audio of a closed-door fundraiser obtained by the Washington Post and NBC News, President Trump boasts to donors that he "had no idea" whether he was correct when he insisted to Canadian Prime Minister Justin Trudeau that the U.S. has a trade deficit with Canada. It doesn't. In fact, according to the U.S. Trade Representative in 2016, the U.S. had a $12.5 billion goods and services trade surplus with Canada. Trump sometimes ignores trade in services, which pumps up trade deficit numbers, but that isn't an accurate way to look at the U.S. trade relationship with other countries. As she tried to explain why Trump had been right all along, Press Secretary Sarah Sanders cited trade in goods alone, leaving out trade in services. Services make up a significantly larger share of the US economy than goods production. And it isn't clear from Trump's remarks whether that is really what he was talking about. Trump was in the midst of a 30-minute speech at a fundraiser in St. Louis on Wednesday when, according to the Washington Post write-up, he riffed on a conversation he'd had with Trudeau.
" 'So, he's proud. I said, "Wrong, Justin, you do." I didn't even know. ... I had no idea. I just said, "You're wrong." You know why? Because we're so stupid. ... And I thought they were smart. I said, "You're wrong, Justin." He said, "Nope, we have no trade deficit." I said, "Well, in that case, I feel differently," I said, "but I don't believe it." I sent one of our guys out, his guy, my guy, they went out, I said, "Check, because I can't believe it." ' "
This caught-on-tape moment comes less than a week after Trump signed proclamations putting stiff tariffs on steel and aluminum imports. Those tariffs won't immediately apply to Canada and Mexico, as those countries are in the midst of renegotiating, along with the U.S., the terms of the North American Free Trade Agreement. Based on other comments, Trump is planning to leverage the threat of tariffs to negotiate better trade terms with U.S. trading partners. It's not clear how this admission that the president contradicted another world leader without basis will affect future negotiations or relationships with Trudeau and other leaders. A failure to agree on basic facts would seem to make such negotiations more difficult. Asked by reporters during a photo opportunity in the Oval Office whether he has always been truthful with Trudeau, Trump ignored the question. But he is standing by his assertion that the U.S. has a trade deficit with Canada, tweeting Thursday morning, "P.M. Justin Trudeau of Canada, a very good guy, doesn't like saying that Canada has a Surplus vs. the U.S.(negotiating), but they do...they almost all do...and that's how I know!" Canada is America's second-largest goods trading partner, according to U.S. data. Trade with Canada supported some 1.6 million jobs in the U.S., according to 2015 Commerce Department figures. A spokeswoman for the Canadian government declined to comment on Trump's remarks and directed NPR to a tweet from the Canadian ambassador to the U.S., David MacNaughton, who cited the same American figures. This is far from the first time Trump has inaccurately described the trade relationship with America's neighbor to the north. In a December New York Times interview, Trump claimed that "[We lost] $17 billion with Canada — Canada says we broke even. But they don't include lumber and they don't include oil. Oh, that's not. ... [Inaudible] ... My friend Justin [Trudeau, the Canadian prime minister] he says, 'No, no, we break even.' I said, 'Yeah, but you're not including oil, and you're not including lumber.' When you do, you lose $17 billion, and with the other one, we're losing $71 billion." NPR's Domenico Montanaro fact-checked this at the time. It is entirely unclear where Trump got his numbers. In a recent paper, Canada-based researchers said that if energy exports are excluded, the country runs a $78 billion manufacturing trade deficit with the United States.